What better way to spend an evening than donating some money to a good cause and being awarded with some finely crafted homebrew? That's exactly what is going on this Thursday night at Local Habit in Hillcrest. My homebrewing buddy, Jeff Crane, is donating a special blended cask of a two year old Sour Belgian Brown Ale and a 14% Imperial Stout cask that should be a beautiful treat to everyone there. 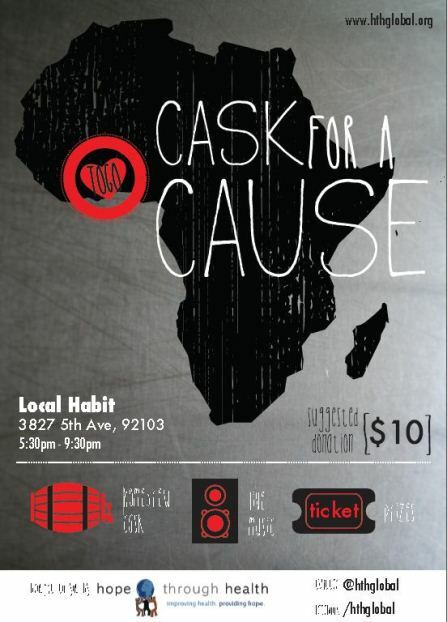 Join the SoCal Chapter of Hope Through Health for “Cask for a Cause,” an evening of community and craft beer to benefit HIV/AIDS initiatives in Togo, West Africa. Philanthropic partner and popular farm-to-table restaurant Local Habit is hosting HTH on this special night, with all proceeds from the cask, raffle and 10% of restaurant sales going directly toward underserved communities living with HIV/AIDS abroad. This fine evening will feature a special donation sour beer on cask, live music from bluegrass band Songs for People (www.wesingsongsforpeople.com), and raffle prizes which feature rare beer and other fantastic goodies! Jeff Crane has brewed a special cuvee for this event by blending together a 2 yr old Oud Bruin (sour Belgian brown ale) with a 14% Imperial Stout. The end product has a tart cherry aroma with rich dark fruit flavors and a balanced sweet-sour finish. Other specially made local beer will also be available that night, so be sure to come out and try these one-of-a-kind brews!